The Bank of Canada’s recent interest rate cut may be a gift to active homebuyers, but could do more harm than good to the national housing market longer term, an economist warns. Capital Economics economist David Madani says the benchmark rate cut, which has led lenders to lower their mortgage rates, won’t do much to stop home sales and prices from sliding in oil-dependent parts of Alberta. The lower rates might support housing activity in other key markets, he says in a note, but “we fear that this will only fuel greater overvaluation, higher household debt and more overbuilding. "Accordingly, we remain deeply concerned over the longer-term prospects for the housing market." Madani says he expects house prices to fall by up to 15 per cent in Calgary in the months ahead. ”Similar declines are likely in Edmonton,” he wrote. Meantime, sales in persistently hot markets such as Toronto and Vancouver are up 6 per cent and 9 per cent, respectively, in January. 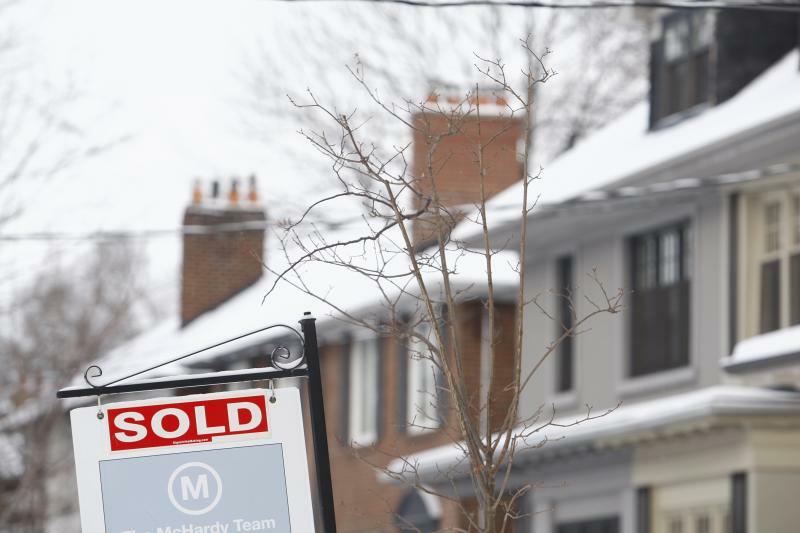 The Bank of Canada’s rate cut came on Jan. 21, and mortgage lenders responded a few days later, which suggests sales activity could rise further in the coming months. “If the Bank of Canada cuts rates further, as we expect, the added stimulus from lower mortgage rates would help to support home sales in regions unaffected by the oil slump,” Madani says. By his calculations, a 50-basis-point decline in a standard five-year mortgage rate will lead to a 5.5-per-cent increase in home sales from one quarter to the next. Madani warns of an increasing number of “higher-risk home buyers” who are getting loans from less traditional lenders. “Since much of this lending is essentially sub-prime, we fear that this type of lending and its support to home sales in the short term will only lead to even greater problems and more painful adjustments in the longer term,” says Madani, who forecasts home sales and prices across Canada to fall 2 per cent in 2015. “Over the longer term, we still expect home prices to fall by as much as 25%,” Madani wrote. Other economists aren’t as pessimistic about Canada’s housing market. Royal Bank of Canada economists haven’t changed their view that there will be a soft landing in the Canadian housing market. It will just take happen a bit later than expected now that rates are falling again, not rising. “We still expect a gradual cooling in activity beginning in 2016, when interest rate increases begin to take a bite out of affordability,” says RBC economist Laura Cooper. Meantime, Cooper expects Canada’s market will be relatively balanced overall between buyers and sellers. The surprise interest rate cut will add a temporary boost in many markets, especially those that benefit from lower oil prices and the resulting drop in the Canadian dollar. For Ontario, RBC is forecasting house prices to rise 5.2 per cent and sales of existing homes to increase 4.7 per cent this year, compared to forecast of national prices increasing 3.4 per cent and sales gaining 1.7 per cent. RBC expects prices In Atlantic Canada to increase 1.3 per cent, while sales slip by 1 per cent. In B.C., home prices are anticipated to rise 5.6 per cent and sales to jump 10.5 per cent. In Alberta, RBC expects sales to drop 15.7 per cent this year, and prices to slip by about half a per cent. “It’s not really a sharp correction,” Cooper says, noting the Alberta market has been booming in recent years. Bank of Nova Scotia senior economist Adrienne Warren says the rate cut is relatively modest and “not a game changer” for Canada’s housing market. “What it does do is reinforce that it’s a very attractive interest-rate environment for buyers,” says Warren. While more buyers are expected to use the lower rates to get into the market, Warren says many consumers are still cautious about sluggish growth across Canada’s economy as a whole.